On a crisp, sunny autumn afternoon, the 1970 World Series began in Cincinnati’s brand-new Riverfront Stadium. The Reds and the Baltimore Orioles had breezed through their respective League Championship Series to meet at the apex of the baseball season. For the visiting Orioles, the taste of bitter disappointment lingered like castor oil on their tongues from the previous year’s defeat at the hands of the New York Mets. Baltimore had been heavy favorites in the 1969 Series, but lost in five games to the “Amazing” Mets. The goal in 1970 had been to avenge their frustration. Elrod Hendricks homered in the fifth inning to tie the game. In the bottom of the sixth, Reds first baseman Lee May sent a grounder down the third base line that just crossed over the bag. Brooks Robinson fielded the ball, and with his momentum carrying him into foul territory, stopped and threw the ball off balance to first base. First baseman Powell stretched to catch the one-hopper, and nipped May in the spectacular – at both ends – fielding play. The next two Reds hitters reached base, so a potentially disastrous inning was avoided. Brooks Robinson’s seventh-inning home run gave the Orioles their first lead, and eventually a 4-3 victory in Game One as they took the Series four games to one. When Powell was 12 he pitched for the Lakeland Little League team that made it to the Little League World Series in Williamsport, Pennsylvania. Carl was the catcher and Charlie played in the outfield. The team’s run was short-lived; it lost to Schenectady, New York, 16-0, in its first game. Carl Taylor went on to a six-year major-league career (1968-1973), mostly with Pittsburgh and Kansas City. Charlie spent a couple of years (1962-1963) with the Baltimore organization in the lower minor leagues. In Boog’s teens the Powells relocated to Key West, Florida, where he was a three-sport star (football, basketball, baseball) at Key West High School. He had several college football scholarships, but favored baseball over going to college. Based on scout Fred Hofmann’s glowing reports on the 6-foot-3, 235-pound prospect, Baltimore Farm Director Jim McLaughlin offered Powell a $35,000 bonus. Powell made the jump to Rochester of the Triple-A International League in 1961 and led the league with 32 home runs while hitting .320 with 92 RBIs. He was called up to the Orioles late in the season and made his major-league debut on September 27 at Yankee Stadium in New York. He collected his first major-league hit the next day, a single off Bill Stafford in the third inning. His minor-league numbers made Powell the most anticipated hitting prospect in Baltimore since the Orioles relocated from St. Louis in 1954. On May 2, 1962, at Metropolitan Stadium in Bloomington, Minnesota, playing left field against the Minnesota Twins and batting fifth, Powell hit his first two major-league home runs, a two-run shot off Jim Kaat in the third inning and another two-run homer off Ted Sadowski in the fifth. Powell’s promising rookie campaign was affected by injuries. On May 29 he suffered a deep muscle bruise above his left knee when he ran into the left-field fence in Detroit. He returned to the lineup on June 7 and was hit in the head by a pitch from New York’s Bud Daley on June 13, being taken off the field on a stretcher. 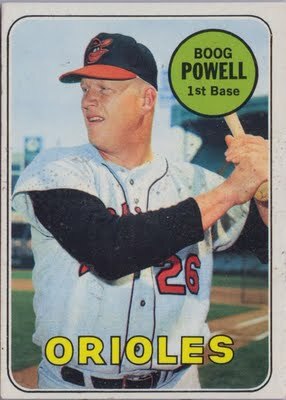 Powell still managed to play in 124 games and hit .243, with 15 home runs and 53 runs batted in. On July 9, during the All-Star break, Powell and Janet Swinton of Rochester, New York, were married. She was a psychology major at Kent State University in Ohio. They had three children. For 1964 Hank Bauer replaced Hitchcock as the Orioles’ manager. Toward the end of the season Bauer, who had played for some championship Yankees teams, found himself chasing his old club. On September 23 the Orioles were tied with the Chicago White Sox four games behind New York. From then until the end of the season, the White Sox went 8-0 and the Orioles 7-1, but they couldn’t catch the Yankees, who went 6-4 in their last ten games. Baltimore finished the year at 97-65, in third place, two games behind the Yankees. That season Boog showed the power output the Orioles faithful were waiting to see. He drilled 39 home runs, drove in 99 runs, and led the league with a .606 slugging percentage. On June 27 he victimized the Senators again, connecting for three homers in Washington. He was zeroing in on Gentile’s single-season Orioles home run record of 46. But a series of injuries, notably a sprained wrist suffered in Boston on August 20, causing him to miss 28 games. In 1965 Bauer moved Boog to first base but the big lefty slumped. His home-run total dropped to 17 and he hit just .248. During the season Bauer fined Powell for being overweight; Boog battled to keep his weight down throughout his career. After the 1964 season the Orioles acquired Frank Robinson, relieving Powell of some of the pressure of being the team’s main power source (Gentile had been traded after the 1963 season). Although Powell started the 1965 season 1-for-34 at the plate, he rallied to hit .384 in June and went on to a fine season. He hit three home runs on August 15 against the Boston Red Sox at Fenway Park. He finished with 34 home runs and 109 runs batted in, and was named the American League Comeback Player of the Year as well as the American League first baseman on The Sporting News’ all star team. As expected, the trade for Frank Robinson proved fruitful for the Orioles. He won the American League Triple Crown and Most Valuable Player award, and led the Orioles to the pennant. In the World Series Powell batted .257, but it was the Orioles’ pitching that grabbed the headlines. Led by consecutive shutouts by Jim Palmer, Wally Bunker, and Dave McNally in the last three games, Baltimore swept the Los Angeles Dodgers. The Orioles slipped to sixth place in 1967, hobbled by injuries to several players (Palmer, McNally, and Frank Robinson among them) and a few down seasons. Powell had a dismal year, hitting .234 with only 13 home runs. He was benched for much of the second half as Bauer played Curt Blefary at first base. The next year the Orioles fired Bauer in midseason. Under his replacement, Earl Weaver, they finished in second place. Powell led the team in home runs (22) and runs batted in (85), and made the first of his three All-Star Game appearances. He struck out twice in two plate appearances during a 1-0 defeat at the Houston Astrodome. He was named to the league all-star team by The Sporting News after the season. After sweeping the Twins in the playoffs, the Orioles fell flat in the 1969 World Series, losing to the underdog New York Mets in five games. Powell had a disappointing Series, hitting .263 with no extra-base hits and four strikeouts. After sweeping Minnesota in the American League Championship Series, the Orioles faced Cincinnati in the World Series and disposed of the Big Red Machine in five games. In Game Four, Johnny Bench lifted a high pop towards the first-base dugout. As Powell drifted over, he leaned over the dugout to catch the ball, but it hit his glove and popped out. Showing tremendous reflexes, he caught the ball barehanded to get the putout. Boog hit .294 in the Series with two home runs and five runs batted in. The Orioles went into the World Series again in 1971 after cruising through the pennant race and sweeping Oakland in the ALCS. Powell fell off from his 1970 MVP season, and he was hitting below .200 into late June. Weaver issued a “hit-or-sit” ultimatum to Powell and he improved, but just when he was coming out of his slump, he suffered a hairline fracture of his right wrist. He was out of action for two weeks. He finished the year with a .256 batting average, 22 home runs, and 92 RBIs. In the second game of the ALCS Powell hit two homers off Oakland’s Catfish Hunter. But Baltimore lost the World Series to the Pittsburgh Pirates in seven games. Powell had a dismal Series, posting a .111 batting average with only three singles in 27 at bats. In 1972 Detroit snapped Baltimore’s stranglehold on the American League East Division, taking advantage of the Orioles’ dramatic offensive dropoff. Powell did not climb over .200 until mid-July. He tried wearing glasses in June in an effort to better see the pitches. “Glasses are worth a try,” he said when word got out that he would try them. “I’m not expecting them to be a cure-all. These things do sharpen things up a bit, though. They can’t hurt anything. I’ve got to get all the advantages I can.”11 But he quickly discarded them, and discontinued trying different stances at the plate. “I’ve come a long way, I’ll tell you that,” said Powell. “I’m just seeing the ball and swinging the bat better. That’s all.”12 He batted .252 for the season. In the last three months of the season, Powell collected 17 of his 21 home runs and 61 of his 81 RBIs. The Orioles regained the top spot in the American League East Division in 1973 and 1974, although they lost in the ALCS to Oakland in both years. Powell hit .265 both seasons, but a sore shoulder cut into his playing time in 1973. In 1974 the Orioles were in a close division race as the season came to a close. Powell was benched in late August in favor of Enos Cabell. “Originally I intended to keep him out of the lineup only three or four days,” Weaver said. “But when we went on a winning streak with Enos playing, I wasn’t going to change anything.”13 Inserted back into the lineup on September 13, Boog hit four home runs and drove in eight runs to help the team post a 15-2 record the rest of the season and wrap up the division. The Orioles had tried to trade Powell at the end of the 1973 season and again during spring training in 1974 but found no takers. Frank Robinson had been traded to Los Angeles after the 1971 season, and had subsequently moved to California and then Cleveland. In December 1974 the Orioles acquired slugging first baseman Lee May from Houston. Seemingly Powell was going to be shown the door, one way or the other. When Indians General Manger Phil Seghi told Frank Robinson, now the Indians’ manager, that his old friend Boog Powell could be had for catcher Dave Duncan, Robinson replied “Yes, yes, yes.”14 On February 25, 1975, Duncan and Al McGraw, a career minor leaguer, were sent to Baltimore for Powell and left-handed pitcher Don Hood. After his sparkling 1975 campaign, Powell’s 1976 season was hampered by a torn thigh muscle in his right leg. For the first time in his major-league career, he played in fewer than 100 games, only 89 of them at first base, and he hit just .209 with nine home runs. He was released at the end of spring training in 1977, and signed with the Los Angeles Dodgers. He was to give the Dodgers insurance against an injury to starter Steve Garvey. But he had only 53 plate appearances, hit .222, almost all as a pinch hitter, and was released on August 31. At the age of 35, he called it a career. In retirement, Powell made a series of commercials for the Miller Brewing Company and operated a marina in Key West, called Boog Powell’s Anglers. In 1979 he was inducted into the Baltimore Orioles Hall of Fame. As of 2010 he ranked among the franchise leaders in many categories: third in home runs (303), fourth in runs batted in (1,063), fourth in walks (889), fifth in games played (1,763), and fifth in total bases (2,698). After the Orioles opened Camden Yards, their new ballpark, in 1992, Powell became a big hit with fans, operating Boog’s Corner, a barbecue stand at the ballpark. Powell credited his wife for his successful transition to life after baseball. “Without Jan, I would have done something, but not been nearly as successful,” he said.17 In 1997, Powell underwent surgery to have a tumor removed from his colon, and had successful chemotherapy treatment. 1 Baseball Digest, February 1987, 88. 2 Miami News, March 7, 1962, 2C. 3 Baseball Digest, February 1987, 86. 4 The Sporting News, February 28, 1962, 14. 5 The Sporting News, February 28, 1962, 5. 6 The Sporting News, March 14, 1962, 31. 7 The Sporting News, April 20, 1963, 17. 8 The Sporting News, August 24, 1963, 16. 9 The Sporting News, September 12, 1970, 6. 10 The Sporting News, November 28, 1970, 39. 11 The Sporting News, June 24, 1972, 4. 12 The Sporting News, October 7, 1972, 13. 13 The Sporting News, October 5, 1974, 3. 14 The Sporting News, March 15, 1975, 42. 15 The Sporting News, April 26, 1975, 5. 16 Utica Observer-Dispatch, August 24, 1975, 61. 17 Baltimore Sun, July 15, 1986, 6D. 18 Baltimore Sun, April 10, 2010.